Happy Sunday! I just read this quote this morning as the sun was rising and my pups and I were waking up slowly. At least I was trying to; their agenda is always to wake up and play, play, play! I like this quote, though, and I have really been working on slowing down and noticing what goes on around me, instead of always being on the go. Or, always pushing myself and thinking, “Once I hurry up and finish this, THEN I can be happy…” This is something that my ego tells me and it is completely untrue. For when I do get finish with whatever it is, school, work, running errands, the week…then something else comes up and my ego starts yapping again. This does nothing but take me OUT of that moment, into the future, which has not even occurred yet, and it robs me of my energy, my thoughts, and a moment of happiness in itself. So, when I am in school supposed to be learning something new and bonding with my classmates and my ego starts telling me, “This class is boring…” I have learned to interrupt that ego-driven thought by telling myself, “Or, you can choose to be happy right now, embrace the experience because it may not come again and learn a whole bunch, so you can apply it to your future career.” It is easier said than done, especially in a society that trains people to go, go, go and that you need things on the outside to be happy. I work on it a day at a time and some days I am not as productive as others. I love the times I catch myself really being in the moment.When I am walking my dogs, it is one of the best times. When I am in the center of my moment, walking my dogs, I feel connected to everything. I can hear the birds, I can move with my pups as we walk together, I can smell the trees and grass, I notice colors, I see movement like butterflies fluttering and lizards scampering away to my vibration. Its magical. And if I were on the same walk with my dogs, all in my head with my ego telling me that when I am done walking them I can go on with my day then I would miss the butterflies, and the flowers that bloomed that day, and the birds singing. It amazes me. I will continue choosing happiness and being present in my moments that come along as much as I can. Today, I share with you one of my simplest recipes and a staple in my mind. They are raw, vegan, and full of life! They are one of the most flexible foods and that is why I love them. I can eat them plane or jazz them up with a funky sauce. For the picture above I skinned 4 small zucchinis with a vegetable peeler. I start from one end of the zucchini and peel to the other end. Repeat thins around the zucchini until you can no longer peel. Combine all of the ingredients in a food processor and blend until smooth. Gently run the sauce through the noodles. Serve and enjoy! 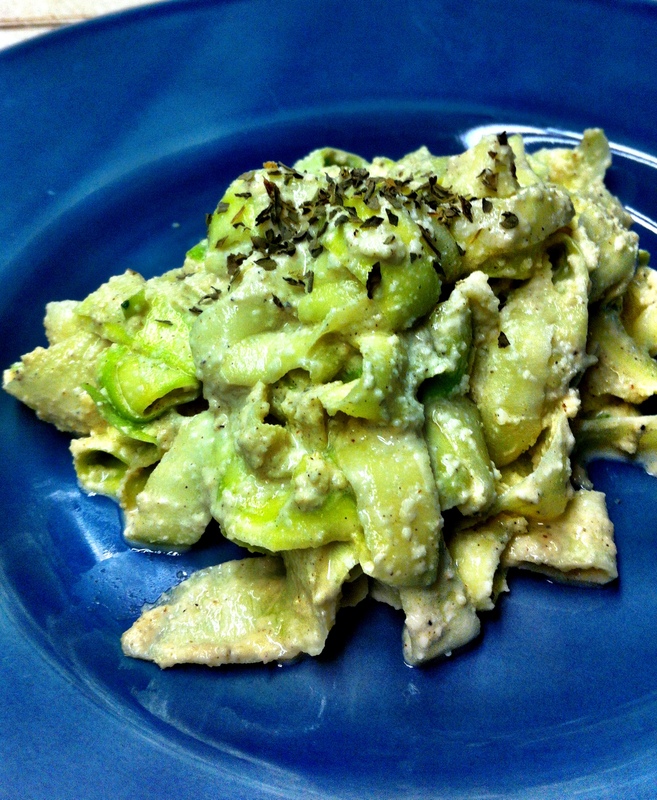 Here is another batch of zucchini noodles I made up, but with a different sauce. For this sauce I just blended an avocado, lemon juice from a 1/2-1 whole lemon (your choice! ), basil, salt, & pepper. I then sprinkled some shelled hemp seeds on top along with some edible flowers to make it pretty! 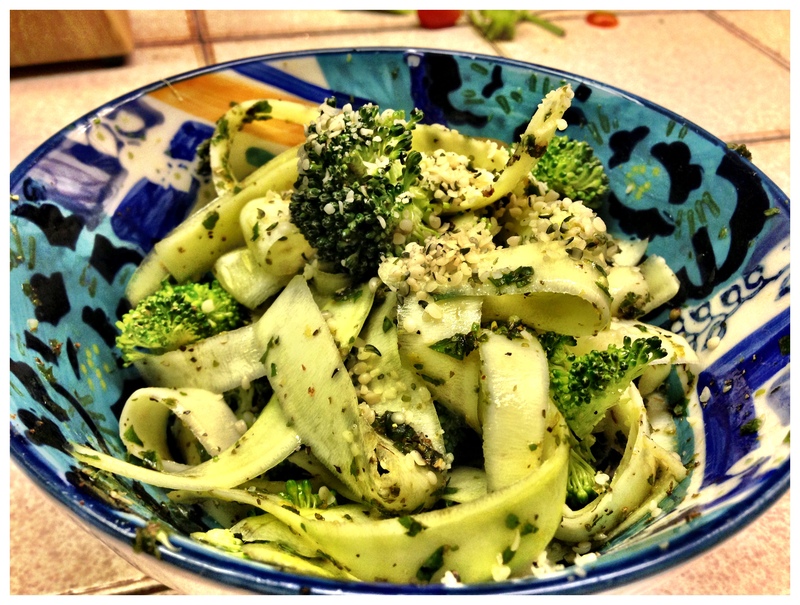 And this last pic, I just tossed in some broccoli to my zucchini noodle mix. For the sauce I blended some basil, olive oil, salt, pepper, and some italian seasonings together. I would have added lemon juice, but I was out of lemons. I just massaged the sauce into the noodles and served with some shelled hemp seeds on top. This is definitely a recipe that you can play with. You could even just try plane spaghetti sauce on them and I am sure it’d be lovely! Whatever you do, be all there. 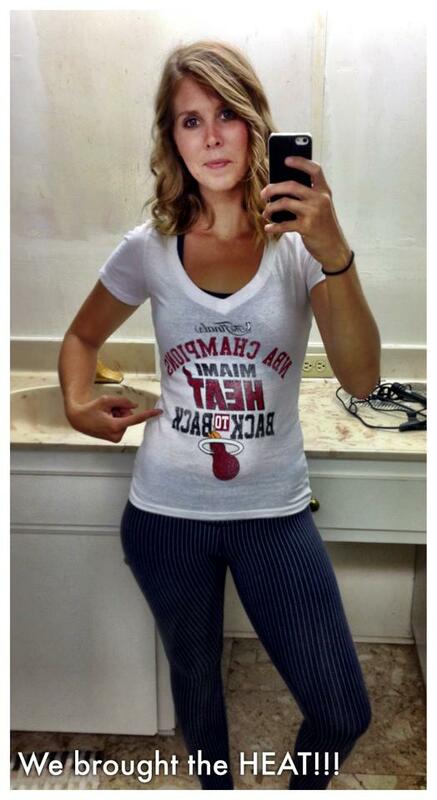 First and foremost, I have to give a shout out to my Miami Heat for winning the 2013 Finals! A week late but woo hoo! I was so stoked I did a head stand for them! A lot of hard work those guys put in and it seemed like the games were never going to end! Besides yoga, basketball is my favorite sport and was my life growing up in grade school and in high school! It is where I had fun, connected with teammates, got my exercise, expressed my emotions, learned how to play well with others, laughed, cried, celebrated, trumped my fears, learned hard work, and had an outlet. I do not play ball as much as I wish I would today, but yoga has been able to fill the same shoes now that basketball used to. A basketball court and a yoga mat are my two places where I feel so connected on every level! And since we are on the subject of balls…ahem…basketballs…I figured that I would keep this next treat in line. coconut…I used the chocolate chips & just sprinkled coconut over the melted chocolate and they were yummy! 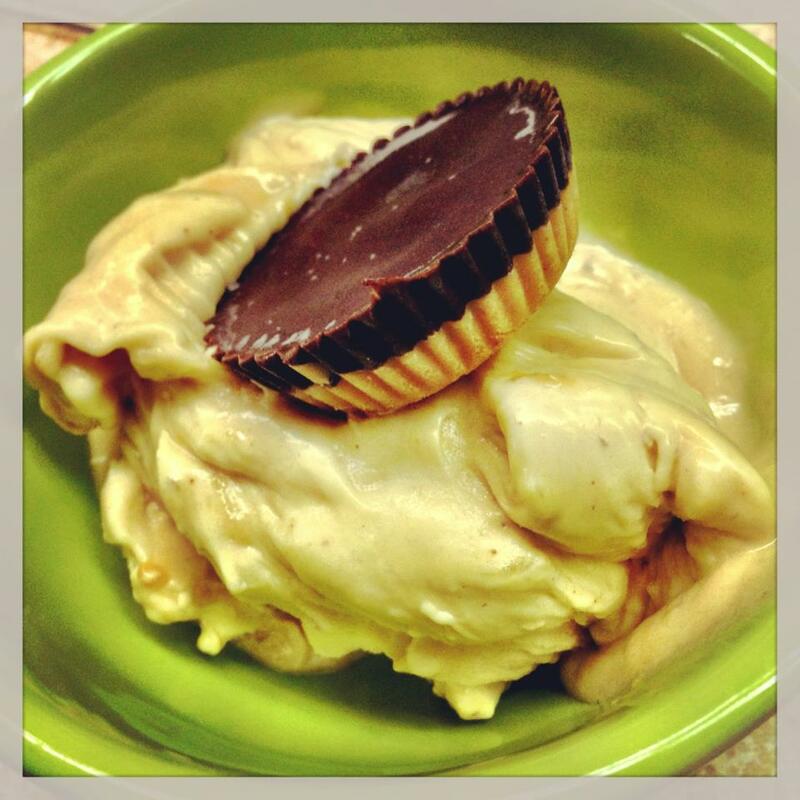 And now that we are on the topic of peanut butter…I will add one more delight to the mix. 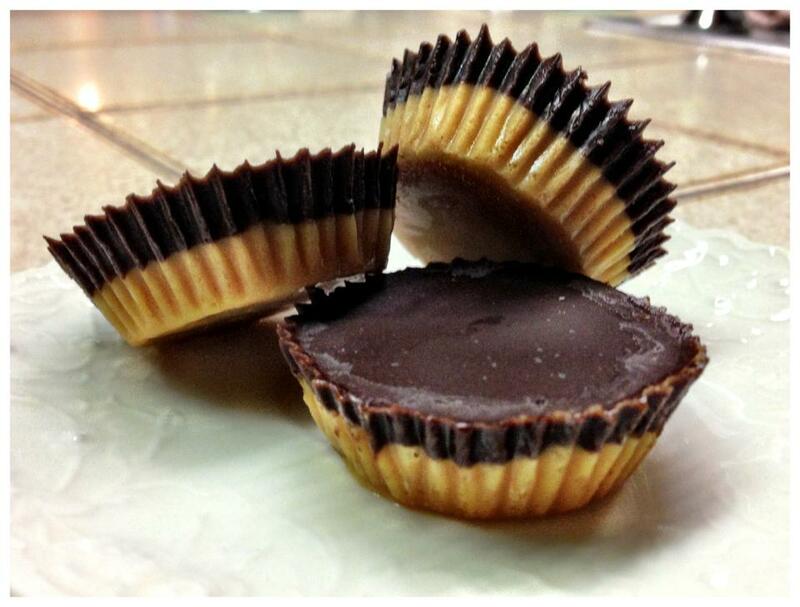 So, if you are not into the peanut butter balls, how about peanut butter cups!?! Ohhh yeah! I loved these, too! They were fun to make and they came out adorable, don’t ya think? Mix together ingredients for top layer in one bowl and ingredients for the bottom layer in another separate bowl. Pour bottom later in cupcake wrapper in cupcake pan and then pour the top layer right over. Put in the freezer to set up. I think I left mine in for at least 30 minutes! And then you can either enjoy them as is or use with other recipes as toppings maybe. The night after I made these, I had some raw ice cream. You know I used a peanut butter cup for a topper! It was perfect! And the Raw Ice Cream is perfect just by itself, too. So easy peasy! Slice up one (or as many as you’d like) banana and place in the freezer until frozen or REALLY cold. Then take out of the freezer and put in food processor and blend until creamy like the ice cream man would do it. Done. So, you got three desserts in one post! Have fun with that! 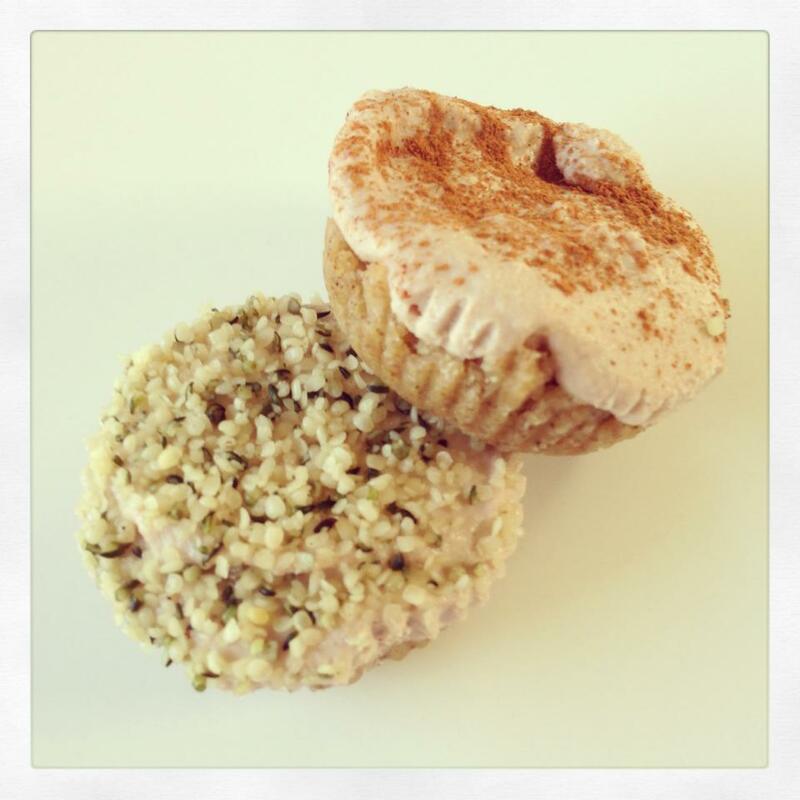 Life is short, eat dessert first…especially if its raw or vegan dessert! Ha! That’s right, this post is about how to create heaven in your hand. Or, maybe I should have said heaven in your belly. Either way, I hope this mini masterpiece that I brewed up today sends your soul to the moon and back like it did for me. When I made the decision to start eating vegan friendly foods I knew that I was going to be giving up some yummies that I just wasn’t sure I could find good enough substitutes for. Thick, delicious, mouth- watering, tastebud -electrifying cheesecake was one of those yummies on my list. Have no fear, cheesecake is here! I give you Raw Mini Cheesecake Bites! Aren’t they just adorable?! Adorable in your mouth, too! Prepare the crust by food processing all the ingredients. Then I sprayed some nonstick spray in some cupcake wrappers (just incase, you prob don’t need spray) and place wrappers in cupcake tin. Then scoop out crust combo into wrappers, serving as your bottom layer. Then put in fridge, while preparing the rest. You can make the crust as thin or thick as you’d like. Then, for the “creamcheese” part, again, in a food processor combine all ingredients. Then bring your crusts back out and scoop the filling on top of each little crust. Again, you can put as much or as little as your prefer. I think I ended up making about 5-6 mini cheesecake bites with the measure ingredients I listed above. Play with it! Put in freezer to let it set up for at least an hour. When you are ready to serve, add ANY, and I mean just about ANY topping of your choice. I love these little bites so much for their flexibility with toppings. I added coconut to one, walnuts to another, chocolate chips, cinnamon on one, and shelled hemp seeds work great,too. And if you are into naked plane jane cheesecake bites, then eat it up, because these guys are just as fab without toppings! So much fun coming up with different ideas! I love letting my creativity fire with stuff like this! I even got real funky with it and created a strawberry surprise with my cheesecake bite! 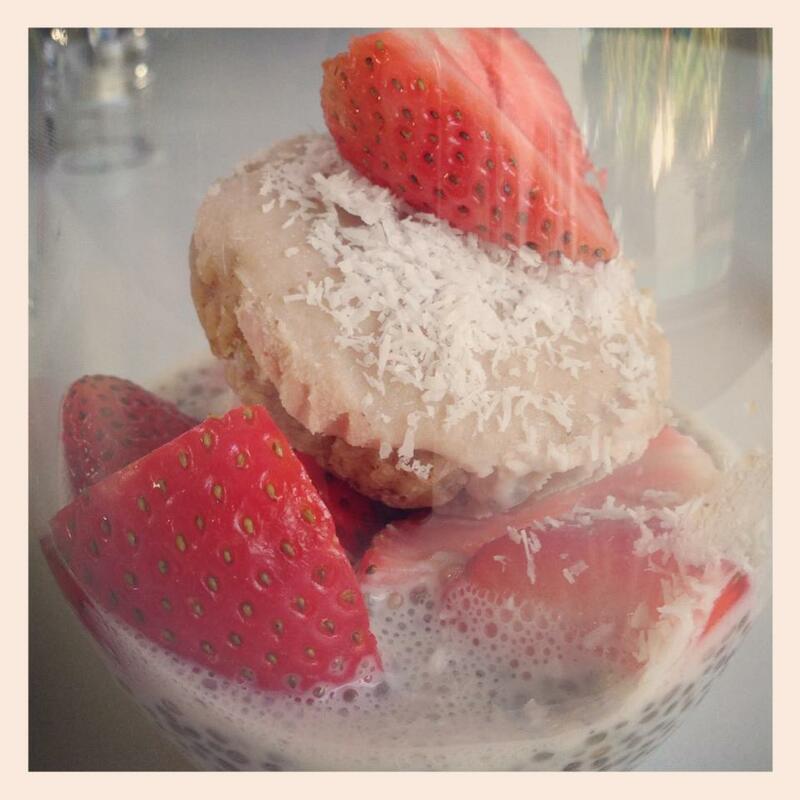 I whipped up some chia seed pudding (1 cup almond milk & 2 tbsp chia seeds), sliced some strawberries, and bathed my cheesecake bite topped with shredded coconut in the strawberry-chia seed bath! So tasty & pretty to look at! Some days, this is my mantra all day long. I learned this mantra from my yoga practice, go figure,and I apply it to my life. Why, you ask? Well, because it works! Where thoughts go, energy goes, right? 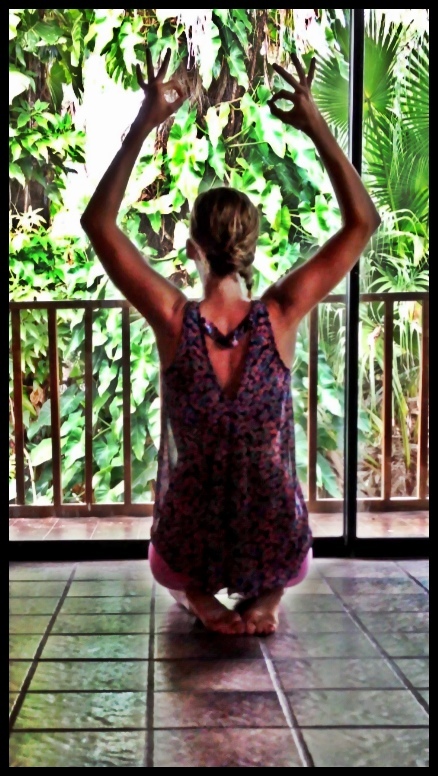 The first time I used this mantra, it was in one of my Vinyasa flow yoga classes. Because it is summer, it seems as if the heated studios we practice in have been extra sweaty. I am all about the extra sweat and releasing extra toxins, but what comes with that is extra opportunities for me to calm my thoughts that tell me, “Wahh! This is crazy! Give up!” One hot, sweaty, deliciously juicy class not too long ago, my mind was doing just this. It was doing nothing but bringing energy to it and causing my body to freak out, feel weak and want to give up. Giving up would have been fine, too, because it is what it is. However, right at that moment of choosing whether to come out of the pose or stay, my yoga teacher gave me my mantra, “I’m breathing in. 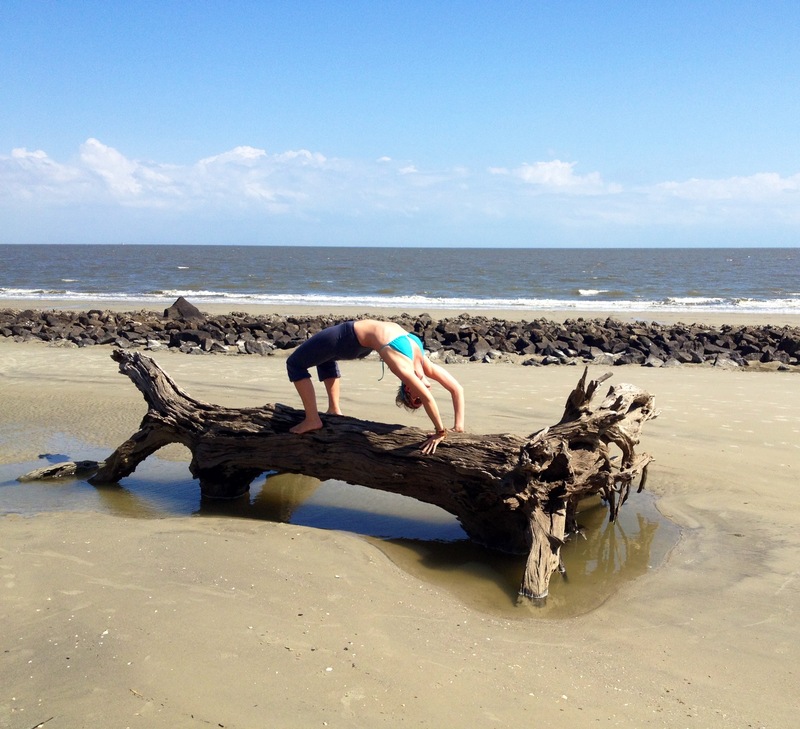 I’m breathing out.” I grabbed it up and started saying it to myself while incorporating my breath and moving through the poses while sweat dripped. It was like magic. My body totally and completely hopped on board and I rode the wave till the end of the practice. I am so grateful for that class and I will forever be. For not only did my yoga teacher provide me with a mantra-mediation for class, but she gave me a mantra for life. Life shows up and I try to live it as it is delivered, but sometimes it is uncomfortable and my mind wants to take me everywhere but in that moment, which is where I need to be the most; feeling, accepting, learning, and embracing. Breathing seems so basic and like “duh!” but when life gets crazy, we tend to hold our breath and tense up, when we should be doing the exact opposite. This is funny to me. I think that human beings may be the only creatures that do this in response to stress. I watch my dogs, and when they get stressed or run around, they don’t stop breathing. If anything, I see them breathe more, suckin’ down air, with their tongues all out. Amazing! Now, for some mexican feasting! I recently posted the yummy raw beet ravioli recipe and I mentioned how I am all about the raw dishes, when they aren’t too complicated. 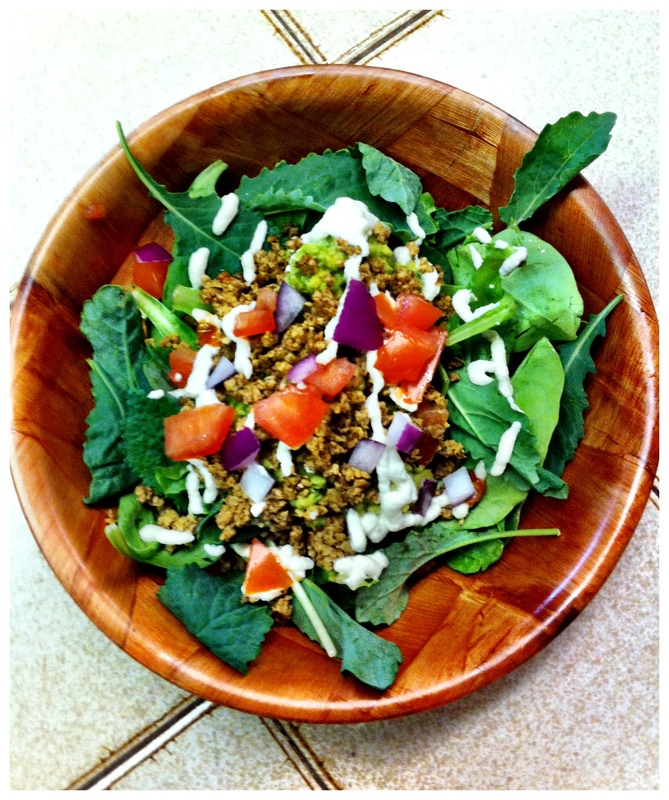 I now share with you a raw taco salad recipe that was inspired by ohsheglows.com. I cannot get enough of her recipes! This recipe is one of my favorites! I know, I know, I say this about every recipe that I post. It’s true though, and I think it’s a good thing! 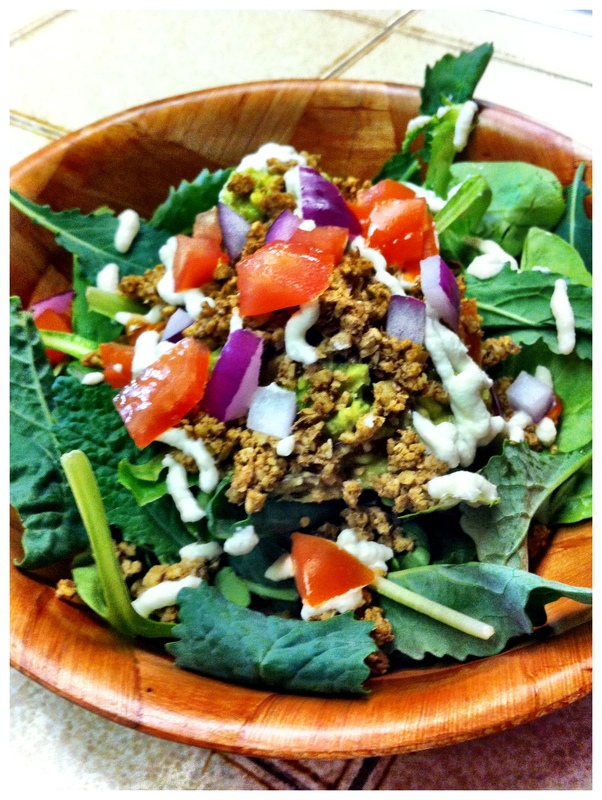 It was so nice to find a vegan taco salad recipe, let alone raw, because just about every time I go out to eat it is at a restaurant with mostly non-vegan dishes with my non-vegan friends and I can more times than not find a taco salad on their menu that I make the appropriate substitutions to. Drain walnuts. Food process walnut meat ingredients on pulse or chop setting until ingredients are combined. Leave walnuts somewhat chunky. Remove and set aside. Drain and rinse cashews/macadamia nuts. Add to processor and process. Stream in water (close to 1/2 cup maybe) and a couple tablespoons of lemon juice. Add water as needed. Sauce should be smooth and not grainy. Add seasonings to taste. Medium size bowl, mash avocado flesh with fork, leaving some chunks. Stir in chopped tomato, onion, lime juice, and seasonings to taste. To assemble all the layers, first, add a nice amount of greens to bast of the bowl, followed by a nice scoop (1/4 cup) of the guac mixture. In the middle, spoon 2 tablespoons of salsa (if using) and then add some of your walnut taco meat over that. Put your cashew sour cream into a plastic baggie, twist baggie so cream moves to one corner, and snip off corner so you can squirt your sour cream on the taco salad over the taco meat. Lastly, add some chips or crackers on the side to dip or crunch over your salad. Let your taste buds have a fiesta! And for the most part, I think I do a nice job of having my thoughts flow similar to this one. Happy, full of love and un-fear based. But I am human, therefore, I have plenty of mornings where I wake up and it may take some coffee and a on-the-spot meditation reading to perk me back up to this level. And some days I don’t reach this state of mind until the evening approaches. Either way, I try to be gentle with myself, allow whatever will show up to be, and know that I always have a choice.Where my thoughts go, energy goes. Sometimes, when I am having trouble interrupting my negative stream of thoughts I will just dance. Have you ever heard that movement is depression’s worst enemy? Ya! I’ll turn on some sounds that get my chakras moving and I dance. And before I know it, because I just moved a little, my once negative stream of thoughts has been shaken out and forgotten about. Sweet! To go along with my twist and shouts, I decided to bring in the right beets to really get ya movin’! I love eating the plant based way! And I love LOVE eating the raw way, but preparing raw foods still intimidate me a bit. Some of the recipes I have come across have just called for machinery or ingredients that I am not capable of achieving right now. 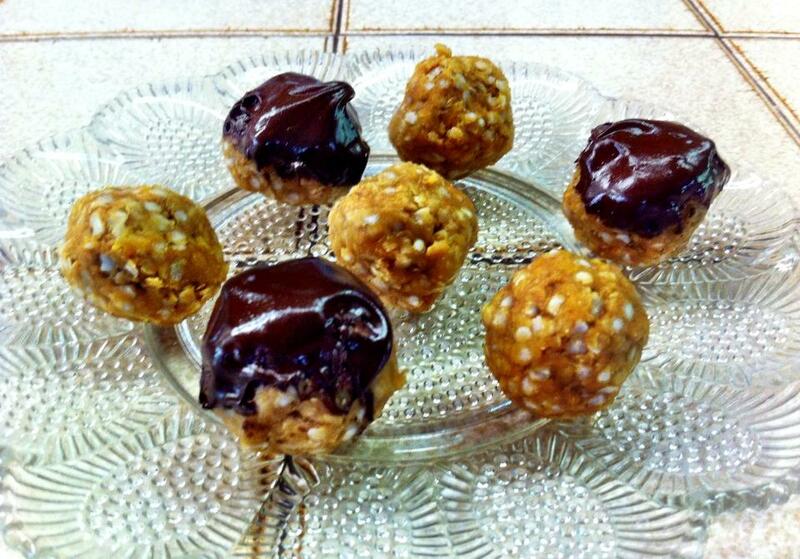 So, when I do raw, I look for the simplest, yet tasty, recipes. I came across this ravioli made from beets and cashew cream and I was on my pink cloud (he he, get it, pink cloud. Ha!) I was inspired by rawfoodrecipes.com to create this work of art. And that is why raw food amazes me and intimidates me all at the same time. It is like art work to me. 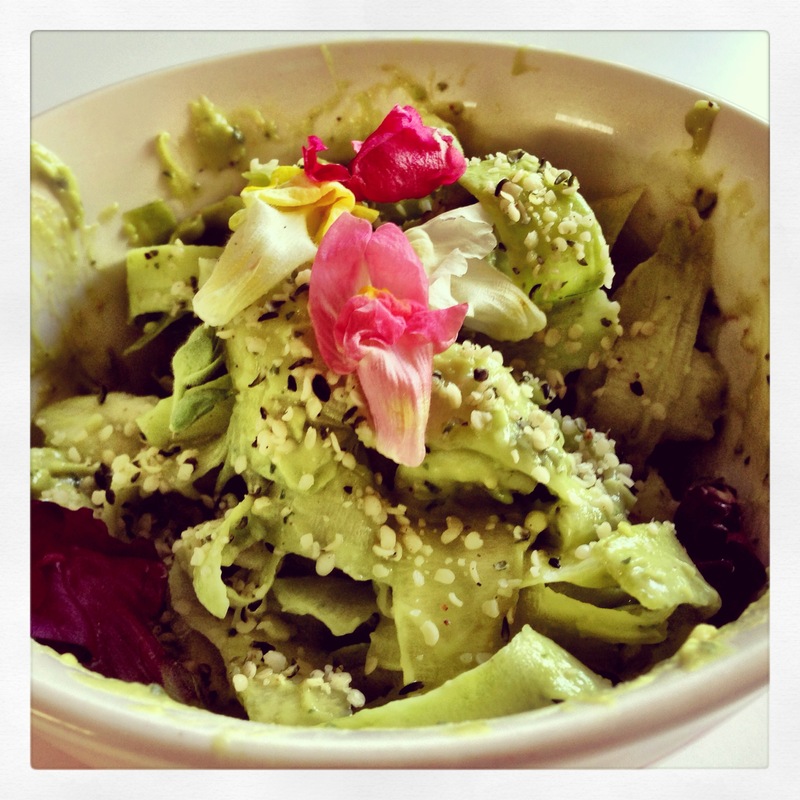 Be sure to check out this site if you want to find not only fab raw recipes, but simple ones, too! I know I plan on creating more from this site. It is just FULL of inspirational goodies! Slice your beets thinly. Then, in a medium bowl whisk together lemon juice, agave and olive oil. Add the sliced beets and toss to coat them. Let the beets marinate in mixture for a few hours, even overnight. When beets are finished soaking and they are softened, blend the other remaining ingredients (cashews, water, oregano, basil, salt, and garlic) until creamy. 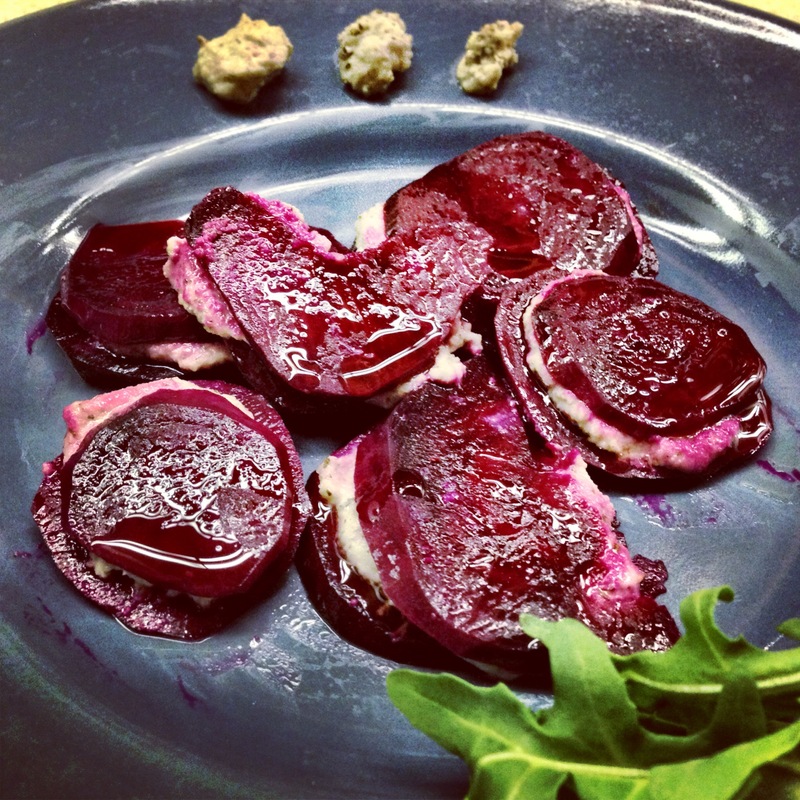 Lay one slice of beet down on plate and place about a teaspoon or so of cashew cream in the center. Top with another beet slice and lightly press down. Drizzle a little olive oil on top when finished assembling beet ravioli. Just to really add a little boogie to things, you must know that beets are super special for our bodies! They build the heart muscle, calms the spirit, promotes circulation, purifies the blood, helps out the liver and adds moisture to the intestines! Soak it all up and dance it all out, my friends! Hello, Summer! So happy to have run into you again! When I think of summer, I think of playing. I think of sunshine, picnics, camping, family reunions, swimming, water balloon fights, sprinklers, the smell of fresh cut green grass, the ice cream truck music that rolls around the neighborhoods, vacations, sunsets, lightening bugs, lemonade, fireworks, sleeping in, staying up late, four wheeling, sleepovers, marshmallow roasting, the smell of barbecues, flowers blooming, bright colored clothes, and fruit, lots and lots of fruit! Which is why I decided to kick off the summer, and maybe create a sweet treat on Father’s Day, with some summer quenching fruit recipes! Given that strawberries are in season, they are not only gorgeous right now, but they have all kinds of crazy-cool benefits that I found out from my Healing With Whole Foods book, by Paul Pitchford. Strawberries are cooling in thermal nature quality and they are satisfying for the functioning of the spleen and pancreas. 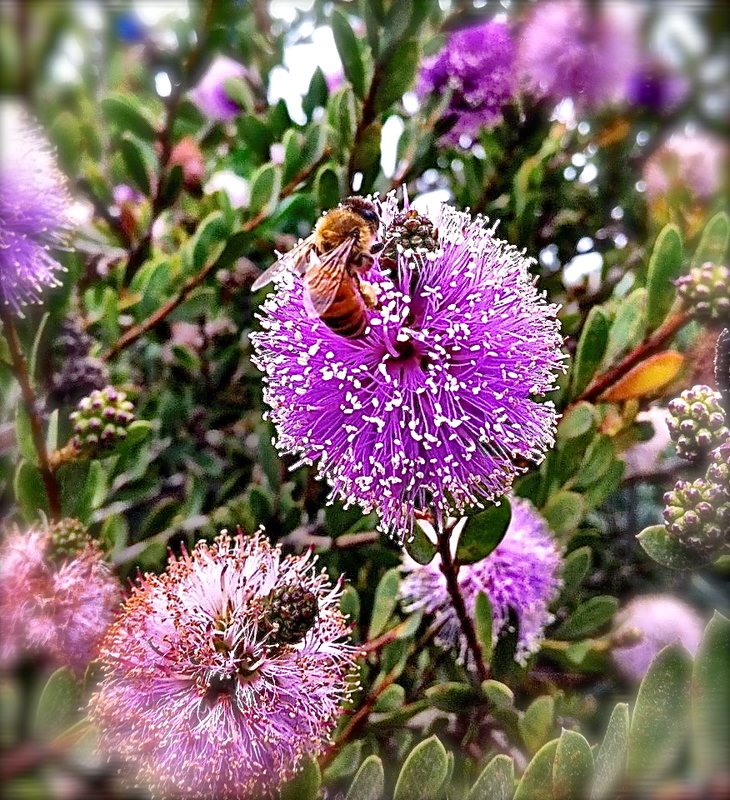 They saturate the lungs and promote the production of body fluids. Strawberries are full of groovy nourishing properties, like silicon and vitamin C, that are beneficial for the restoration of connective tissues and arteries throughout the body. And just a little fun fact, if you would like to add some extra oomph to your teeth and gums and remove the yuckies (a.k.a. tartar), then slice a strawberry in half and rub the inside of the berry on and all around your teeth and gums. Leave the berry-goodness on your teeth and gums for 45 mins and then rinse out with some warm water. I feel that these little red goddesses get a bad rep for being on the “dirty dozen” list, but with some extra care in the rinse cycle, these babies can add some special sweetness to your insides! 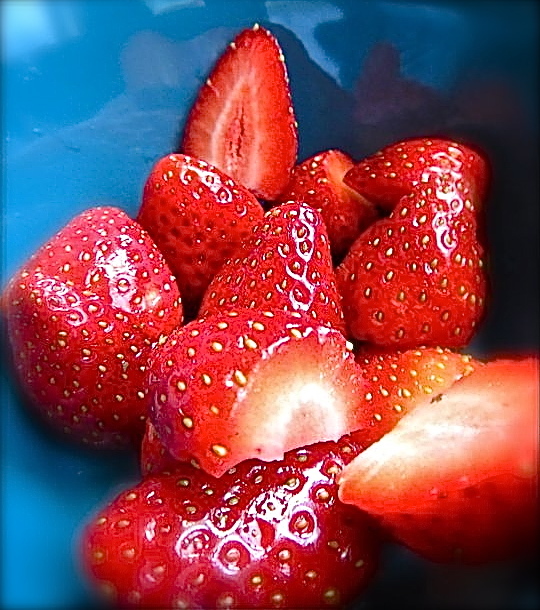 Now for some more strawberry fun, I bring out some recipes. My first recipe was inspired by almondsandavocados.com. Soak quinoa for AT LEAST 8 hours. This disgruntled me a little because I was ready to eat the fruit pizza yesterday when I first saw the picture of it. But, this step is important for the crust to set up just right. Then, its all a breeze. After soaking, add the quinoa, 1/4 cup water, 1 tablespoon of maple syrup, and 1/4 teaspoon of salt to a high speed blender or food processor. Blend until a pancake-like batter substance forms. You want it to be on the thicker side. Then pour onto a pan on the stove top in olive oil over medium heat. Allow to cook approximately for 5-10 minutes until the edges are brown and crisp. Flip. Repeat on the second side. You will end up with a big pancake. After making the crust up, you can start right away with the avocado sauce or place the crust in the fridge, which is what I did, until later when you are ready to serve. Once you create the avocado sauce, you will want to serve right away. Keep all this in mind. Process avocado, 2 tablespoons of water, lemon/lime juice, and 1 tablespoon of maple syrup. Blend until smooth. Spread onto the quinoa crust. Be sure to revert back to childhood and lick the remaining avocado cream left behind on the food processor edges. I know I did! Lastly, decorate your pizza! Get funky with it, too! You can use whatever your big heart desires! 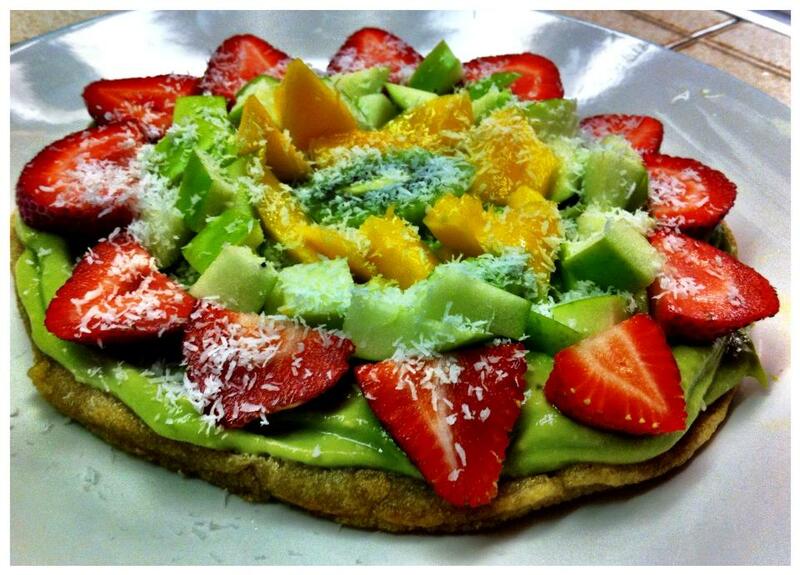 I used strawberries, of course, green apples, mango, and then a kiwi slice in the very center. Then I sprinkled unsweetened coconut flakes all around and served! So fresssshhh! This is the best pizza I have ever indulged in and I didn’t have that carb-cheese hang over afterwards! 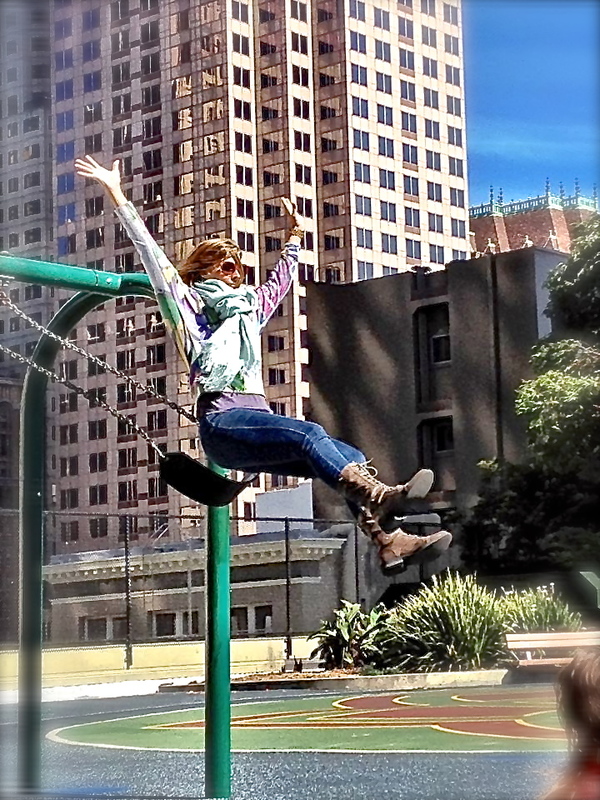 It sent me to the moon it was so taste bud-quenchingly-awesome, just like my picture below that was snapped in San Francisco last summer! 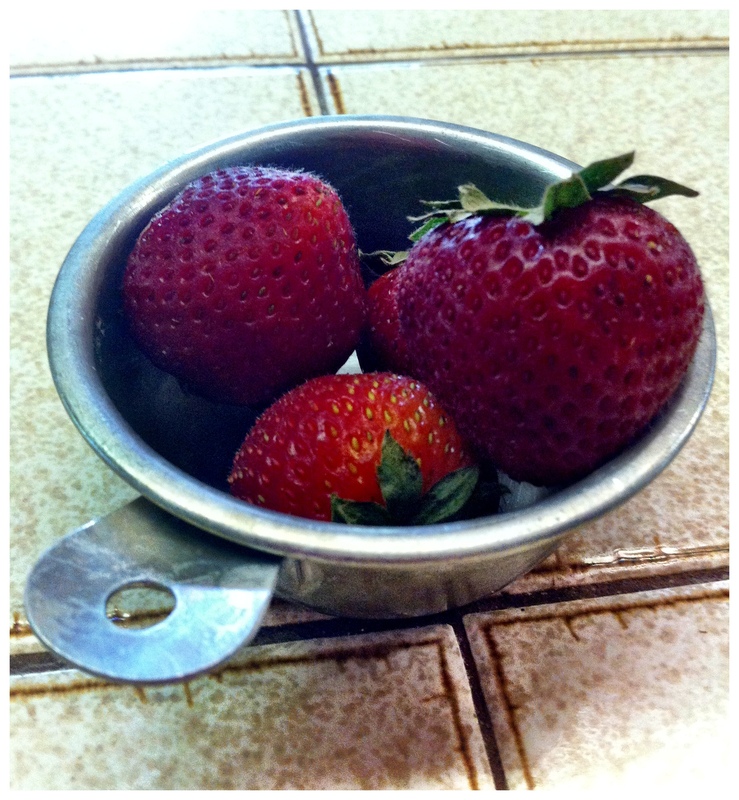 My second strawberry-goodness recipe that I have on here is just as lovely as the first. I used chia-seeds and almond milk to form a pudding-like texture and then I just added the fruit. Ahhh, simplicity sounds so sweet to my ears…and belly! If you have not checked out chia seeds, well then, I strongly encourage you to. They are the next best thing after glitter! Matter of fact, I give you permission to stop right now and make a trip to the store for these little wonders. I promise you, you won’t regret it. Chia seeds can be used in ANYTHING! You can add them in salads, pasta dishes, desserts, and even just a plane glass of water. Not only do they possess flexibility, but they have great health benefits. Ah-MAZ-ing! Next to good old flax seed, chia seeds are considered to have the highest source of omega-3 fatty acids. And for your food history lesson, you must know that they were introduced by the Southwest American Indians. They would consume the seeds for energy during their strength competitions. Eat up and power up! This little treat can be great for breakfast, a snack, or dessert after dinner. Whisk together 2 tablespoons of chia seeds with 1 cup of almond milk for 15 minutes. Then let the mixture settle for 15 mins. Do this for like 3 times, the whisking & settling, because the chia seeds gel up and this helps in the formation of the pudding. Then put pudding in the fridge to chill for a little bit, or eat right away. I like it chilled. Once you are ready to eat, then add your toppings of choice. 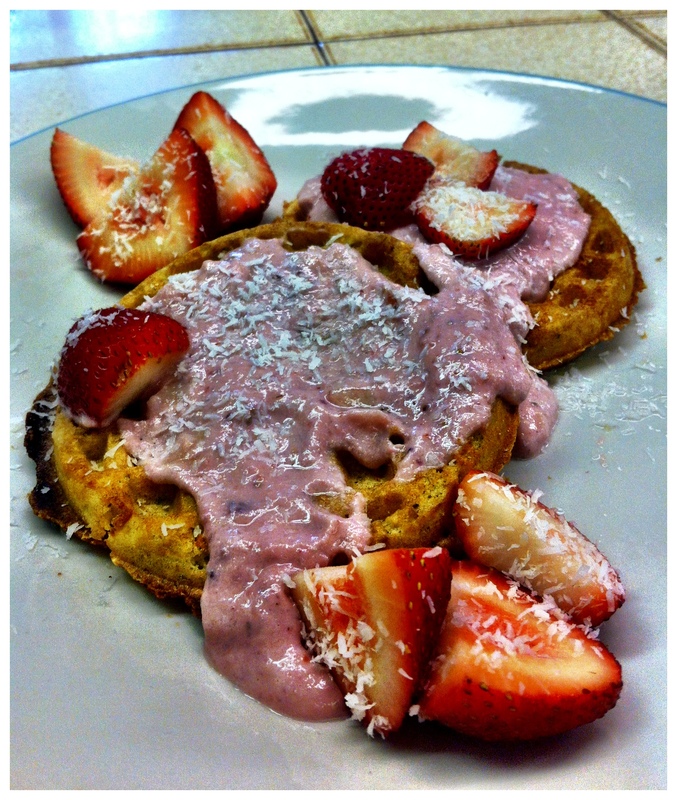 In this photo I did banana slices, strawberries, and unsweetened coconut flakes. 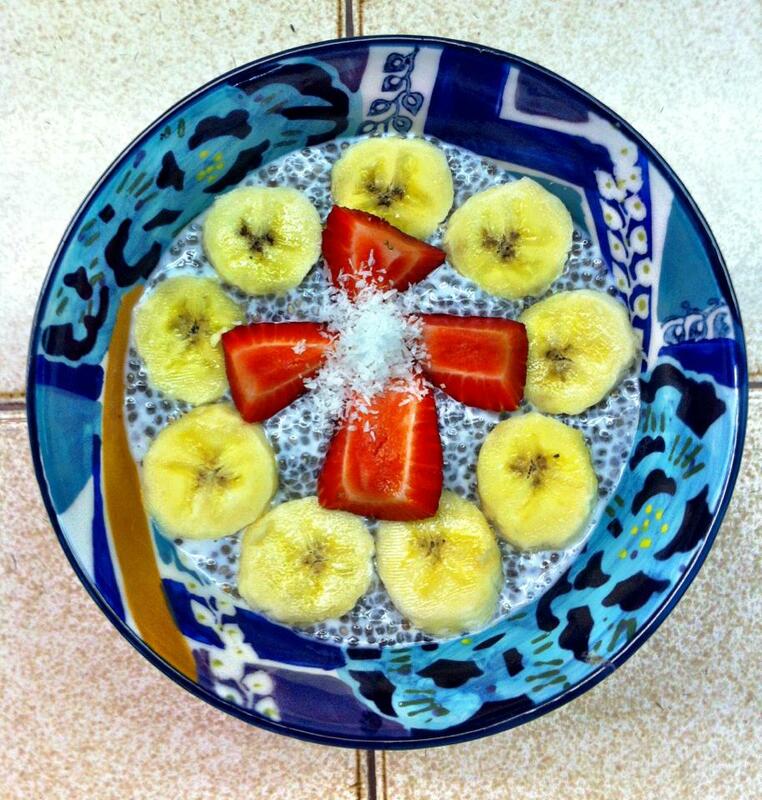 You can add flavor to this chia seed pudding, too. I have added 1/4 teaspoon of cinnamon before. I have added carob powder (or cocoa). I have also tried added a little vanilla extract. Whatever you do, have fun with it! Remember, its summer now! Ring the new season in by engaging in an activity that will let your body know that the seasons are changing! This is important to do for mind, body, and spirit! 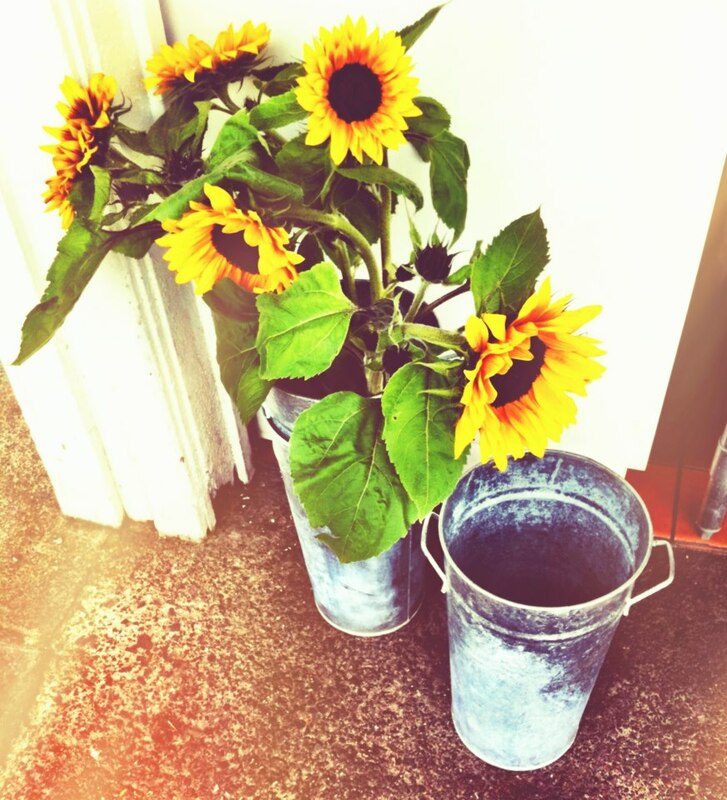 Buy a new outfit, clean our your closet, paint your toes a bright summery color, chase a butterfly, dance the hokey-pokey, take a bath, bite into a watermelon, or pick some flowers and breathe in their sweet fragrance. Whatever you do, smile a lot! 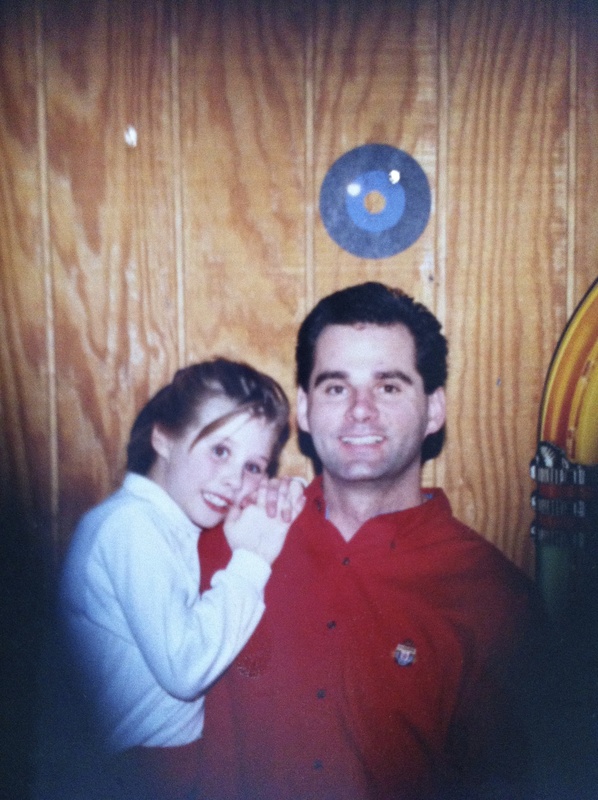 Shout out to my daddy on Father’s Day! I love you and my soul bows to yours. Thank you for always being my hero, my teacher, and my biggest fan! I love you. So, in my yoga practice I have been really working on inversions.You know, hand stands, head stands, tripods, and wheels, among others. I have found them to be the most liberating and challenging poses all at the same time! Some I can do without assistance and some, well, I use my good friend, Wall, to lean on from time to time. 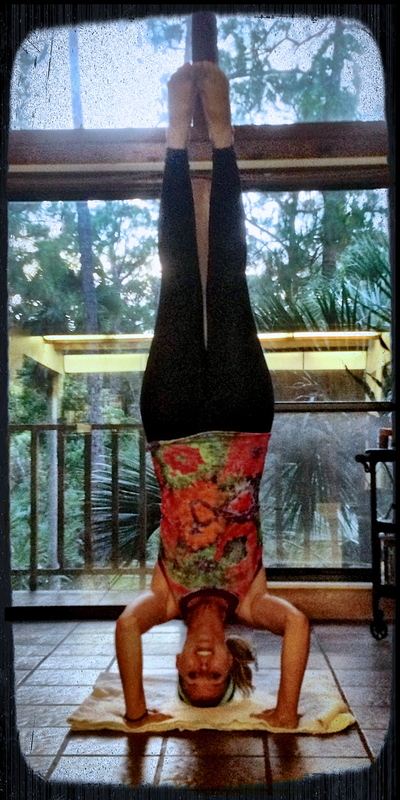 What I have uncovered is that the most challenging aspect of inversions lies in my mind, rather than in my strength. Just like when I am approaching a scary opportunity in life, that fear is all in my mind, too. Funny how life shows up on my yoga mat, er, my yoga mat is a representation of my life. Ha! Unforgettable words that my dad used to share with me as a little girl, “Its all in your mind, Amanda. Go for it!” So, I have been. And with the inversions that I still lean on Wall for, well, instead of judging myself that its not good enough and telling myself that I should have gotten this pose by now, I have moved to a place of acceptance and gratitude. I thank my body for showing up for me. And I keep practicing. And I keep noticing my thoughts. And that is what its all about! 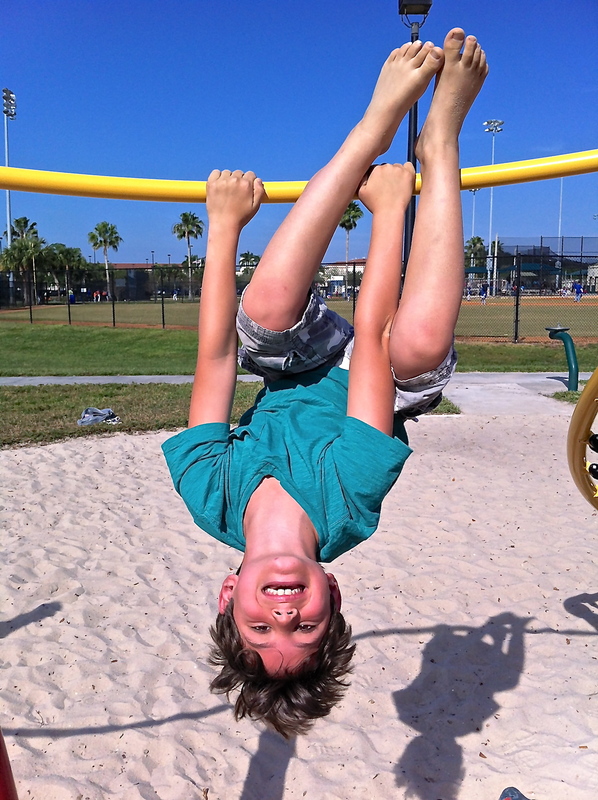 So, here’s to turning your world upside down! I give you Plant-Based “Tuna” Salad! Mash up the garbanzo beans. Then mash and mix all the other ingredients together! Voila! In this pic I used thin brown rice cakes. I loaded up a generous scoop of my tuna salad onto the rice cake. 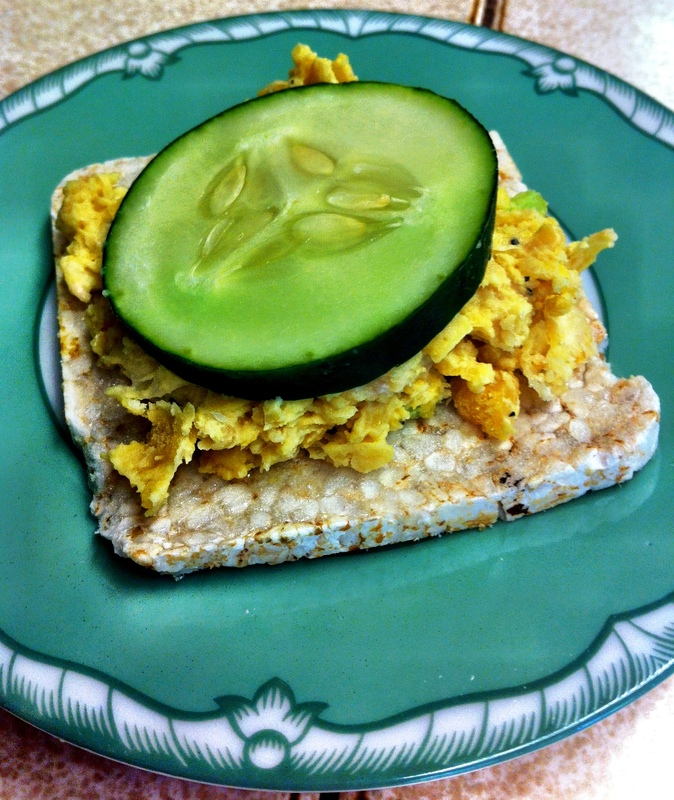 Then, I sliced up some cucumbers and put a slice of cucumber on top of the “tuna.” So tasty! I could not stop eating this. I ate it right out of the container without any rice cake or cucumber, as well. It was THAT good. Also, just a little side note for, garbanzo beans are favorable to the pancreas, stomach, and heart, according to my food bible, Healing With Whole Foods, by Paul Pitchford. You can get a double dose of heart-balancing energy from your headstands and garbanzos! YUM! Puppies with a side of Graham Crackers! 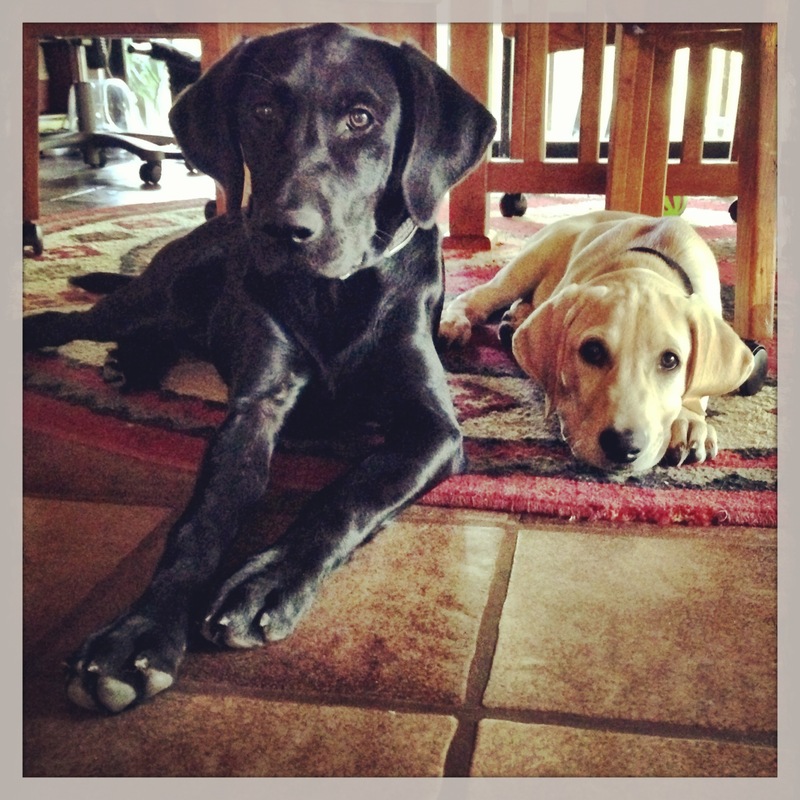 I would like to introduce you to my little darlings, Maya & Leo. Maya is about 6 months old now and leo is about 3 months old. 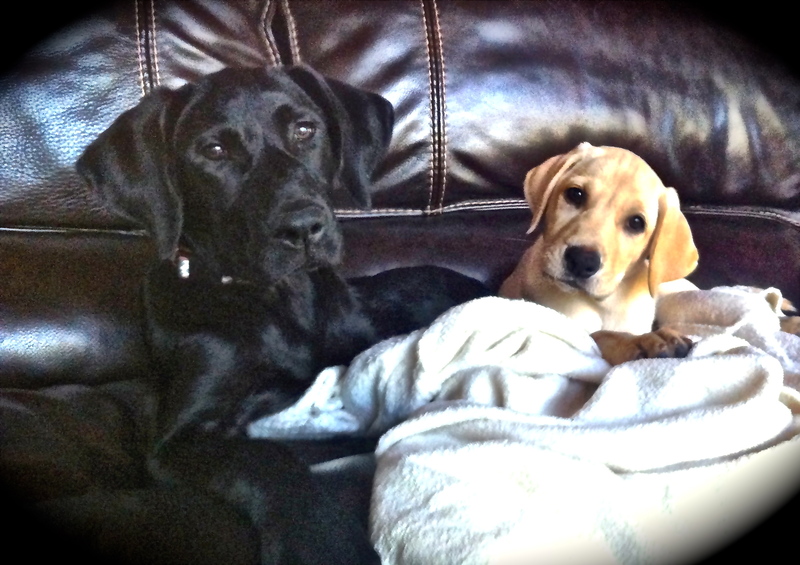 They are both Labrador pups and the most delicious pups I have ever laid my eyes on. Wouldn’t you agree? My boyfriend, Wade, and I adopted Maya first. 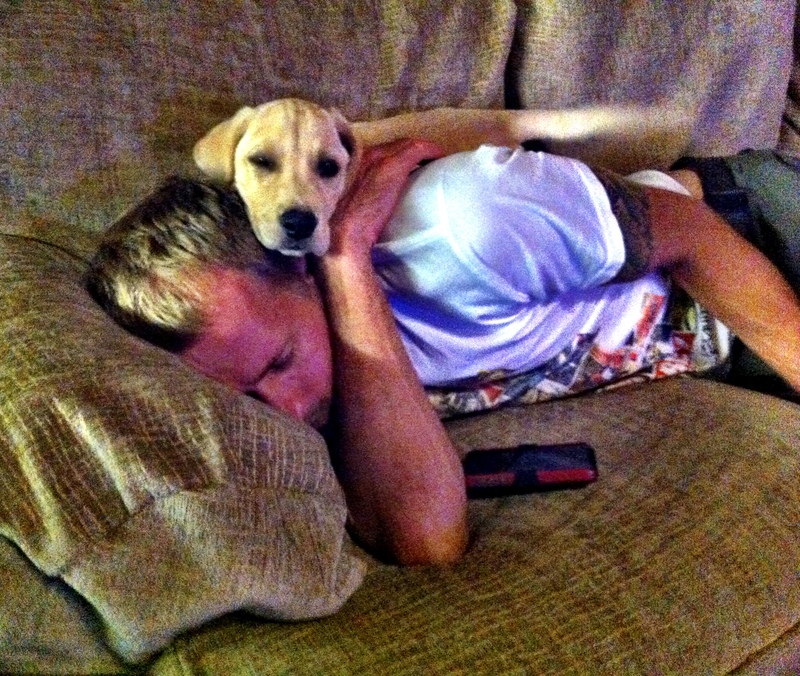 We had the idea that we wanted two dogs to keep each other company and bring double the love and fun into our home, but we started with one to make sure we were capable parents. And after lots of getting up in the wee hours of the morning and cleaning up potty accidents, we decided we were ready for our Leo. We adopted Leo on my birthday! We brought Maya with us to help pick her brother out and to see if they mingled well, and oh, did they ever! They love to cuddle with each other, as well as with us. And it is so delightful! 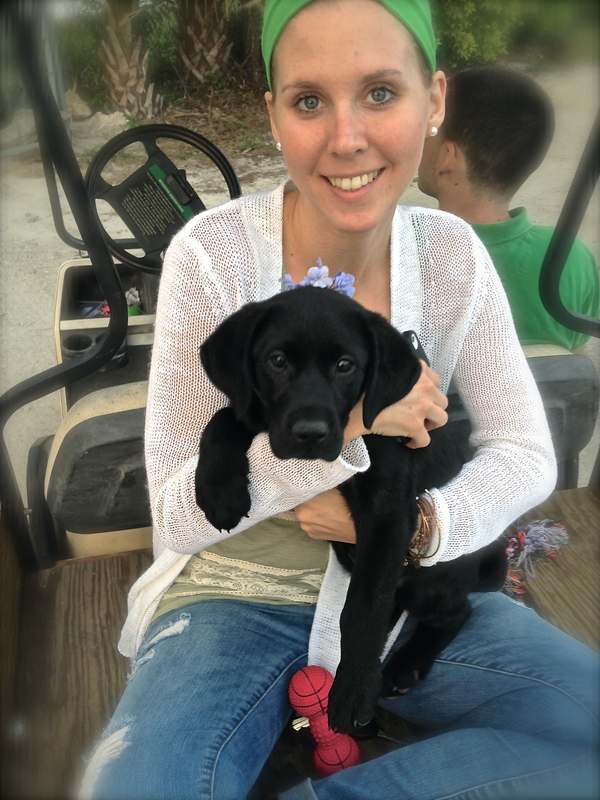 And aside from the cuddling and cuteness, Maya and Leo have brought Wade and I a bucket of opportunities to learn from when it comes to patience, love, forgiveness, kindness, control and being in the moment. How grateful we are to our little fur balls of energy! This past weekend I was looking for a creamy dessert with a crunch, I mean, who isn’t, right? I not only found the dessert sent from heaven, but I also found another one that reminded me of my childhood, which is always a great thing, because that means I get to play! I remember when my mother would serve me graham crackers with a glass of milk. I would dip the graham crackers in the milk, let them soak up the liquid, and then devour! It was always such a great snack at any time of the day: breakfast, mid-day snack, or after dinner for dessert. Mom was a genius! So, I came across this recipe on ohsheglows.com that called for crushed up graham crackers. I did not have any graham crackers, nor was I going to make a special trip to the grocery store. On the same post, there was a recipe for home made graham crackers (probably for people like me who are not going to make that trip to the store, right?). I just happened to have all the ingredients! And, I was off. They not only tasted like, if not better than, the graham crackers I dipped in milk as a child, but they were enjoyable to make and my inner little girl got to make all sorts of fun cut out shapes. It is very similar to making cut out cookies once the dough is made. You just roll it out and design away! 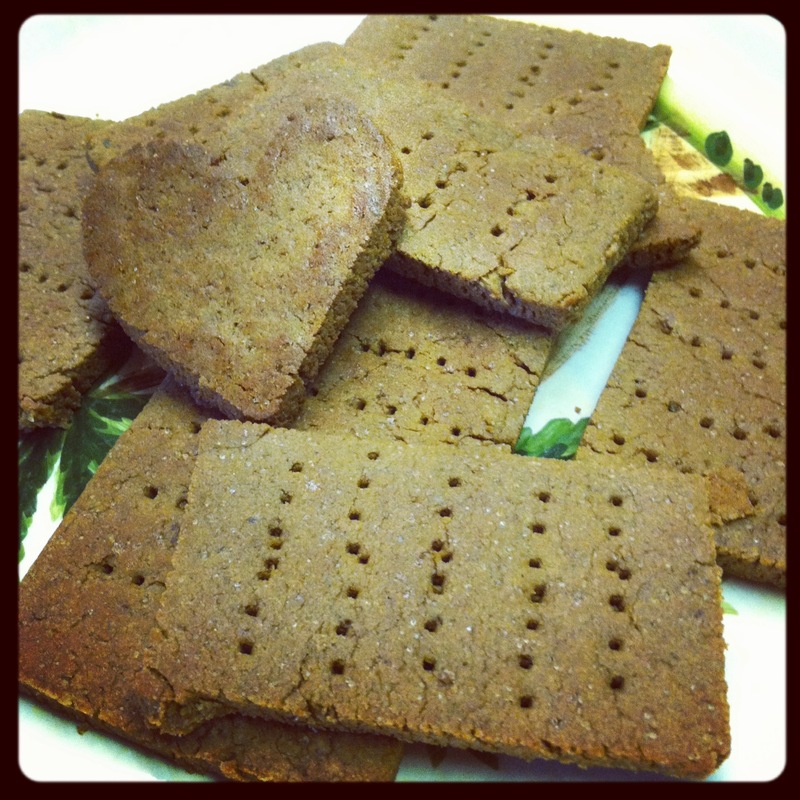 I made hearts, along with squares and rectangles and poked holes in them with a fork to give them the traditional graham cracker look! Then, once the crackers are made you can do SO many fun creations with them. As pictured above, I put some sunflower seed butter in between two graham crackers and made a mini peanut butter sammy. 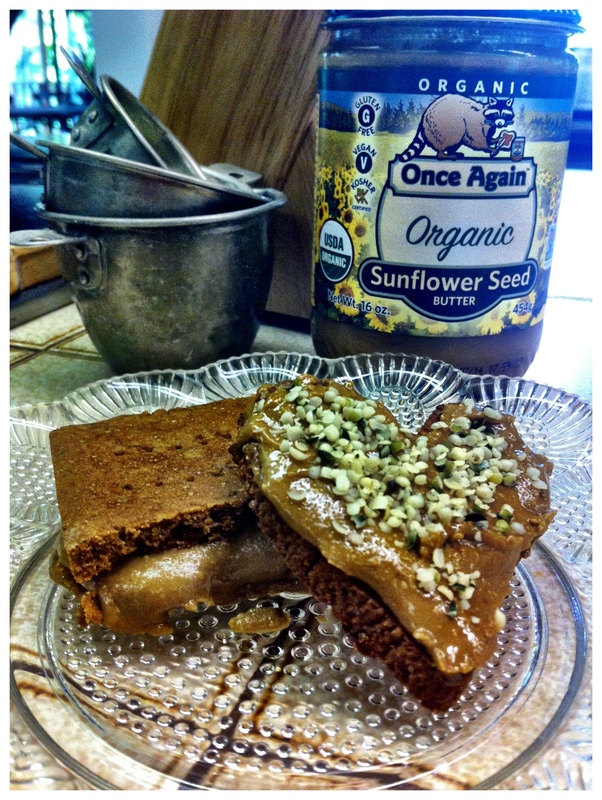 I also lathered some sunflower seed butter on the heart shaped cracker and sprinkled some shelled hemp seeds on top! Ah-Mazing! You could also crush up the graham crackers with a few other yummy ingredients and come up with a fabulous pie crust or cheesecake pie crust. Or sprinkle crushed up crackers on top of some ice cream (raw banana ice cream, of course! Recipe to come in the future)! If your an outdoor-campfire seeker, roast up some marshmallows and make s’mores! What fun! Or, if you want to hop into my childhood memory, simple just serve some crackers plane with a nice cup of almond milk to dip them in! So many possibilities! Here is the recipe for these crackers that sent me down memory lane. Preheat over to 350 degrees. Mix together the flax seed and water in small bowl and set aside for at least 5 mins to gel up a little bit. Mix all of the dry ingredients together in a large bowl. Then mix your wet ingredients in a small bowl, also adding in your water-flax combo. Combine wet and dry ingredients together. Stir with a spoon. The dough will start to turn really thick, and when this starts to happen, forget about the spoon and use those hands, sista! Form the dough into two balls. Lightly flour counter top or cutting board and roll out the balls of dough, one at a time. Be careful not to make the dough too thin when you are rolling it out. Each time you roll the dough out, get your cut outs ready or a knife to create shapes! I was able to draw my shapes with a knife just fine. If you do the traditional square/rectangle graham cracker shape, take a fork and make little holes in the dough down the middle of cracker. Most importantly, have fun! Allow the crackers to cool for about 10 mins and then eat ’em up! Enjoy! But, that does not mean that’s my day to rest completely. For, I was busy experimenting with some new recipes that will make your eyes dilate and your heart flutter! Stay tuned for those to show up throughout the week. This morning, I really wanted to show my taste buds a good time, being that it is Monday and all. Sooo0, I pulled out my Nature’s Path Chia Seed waffles and popped ’em in the toaster. Now, they are just fabulous with nothing on them right out of the toaster. Or, sometimes, I smear some Earth Balance butter on them with a drizzle of maple syrup creating the traditional waffle. This morning, however, I added a little more funk to it. I had bought some delicious looking strawberries from Whole Foods on Saturday and I wanted to make use of them. I also had some cashew cream left over from the night before that I made with a dessert. So, I combined the two and came out with this beautiful shade of pink strawberry cashew cream that I chilled in my refrigerator overnight. This morning, you should have seen me. I was like a little girl tip-toeing out of bed, trying not to wake the sleeping house, to get my presents from underneath the tree on Christmas morning, as I went into the refrigerator to check out my strawberry cashew cream. I taste -tested a little teaspoon’s worth and it was like electricity ran through my body when it hit my tongue. Oh my! I grabbed my toasted waffles and I smeared my strawberry cashew cream all over it and cut up some more fresh strawberries and decorated my plate with them. Finally, I sprinkled some coconut flakes all over it. The taste was so fresh and so perfect in every way! Now I give you the recipe for cashew cream magic. 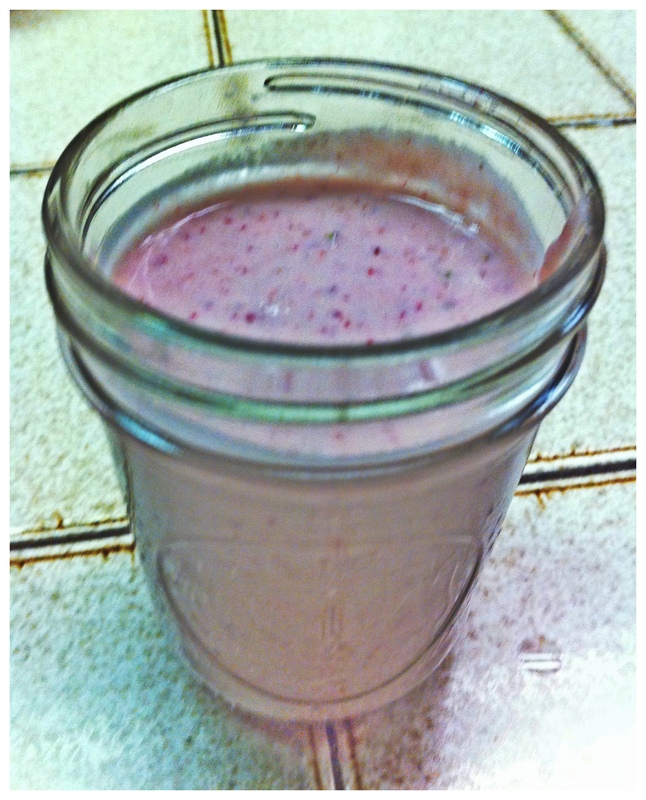 This recipe was inspired by ohsheglows.com‘s strawberry nut cream. Blend all of these ingredients together in a food processor and you will have a basic cashew cream. Then, if you want to take things up a notch, add fruit of your choice. I think I may have added like 5-7 strawberries in with about a cup of the cream in the food processor. I think just about ANY fruit would be just divine: strawberries, blueberries, mango, peaches, banana, raspberries…whatever helps you get your inner goddess on!